We made our home in Santa Fe (see Flickr photos) for two weeks this month. 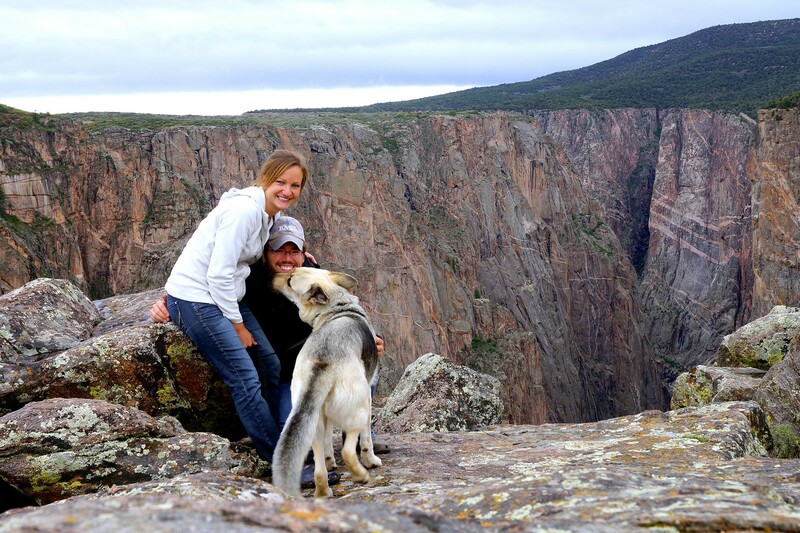 We enjoyed it, spending our anniversary weekend at a resort in Taos and visiting Bandelier National Monument along with the Atomic City, Los Alamos, home of the Los Alamos National Laboratory. Another highlight was meeting the @snowmads and @watsonswander at a Santa Fe brewery. Bandelier National Monument (see Flickr photos) is naturally spectacular with a lot of back country to explore. The Pueblo ruins are fascinating and seem to flow with the landscape – adding, not taking away. Los Alamos was surprising. I expected something else. Perhaps I expected a sense of nostalgia, having read so much of its history. Santa Fe as a whole is a win. It’s a tourist town to be sure, but the trail system is good, the landscape stunning, and there is plenty to see and do. Our only complaint was dicey weather in May due to the elevation. This Memorial Day weekend I resolved that we would see the Grand Mesa. The Grand Mesa is an odd thing. It’s the largest flat-top mountain in the world – over 10,000 ft. It’s also a natural wonder in Civilization V.
We also resolved we would boondock the weekend. We are weary of RV parks and frankly most organized campgrounds. 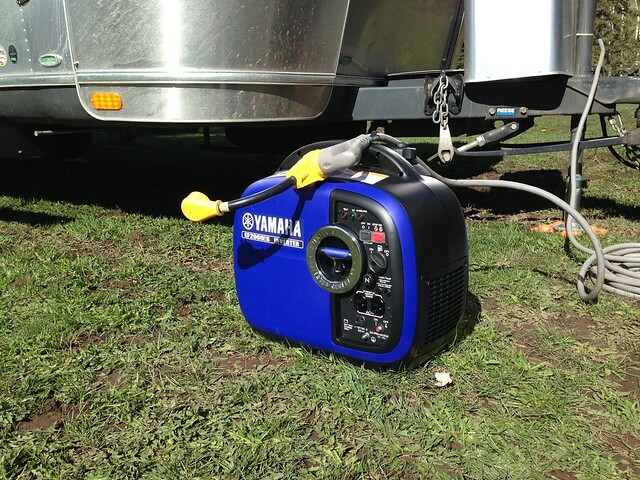 So we bought a Yamaha EF2000iS generator in Santa Fe. This 2000W generator is light, quiet (by generator standards), and can power everything except the air conditioning. It can also be paired with another generator to deliver 4000W, which would power the air conditioning. We set off on Friday afternoon and reached the San Juan National Forest, just north of Durango. 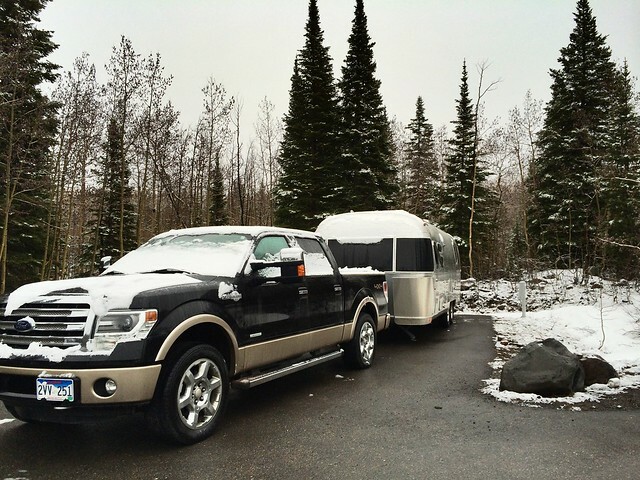 The National Forest permits free dispersed camping throughout. After exploring a few Forestry Service dirt tracks we found a nice spot about half a mile off the main road. 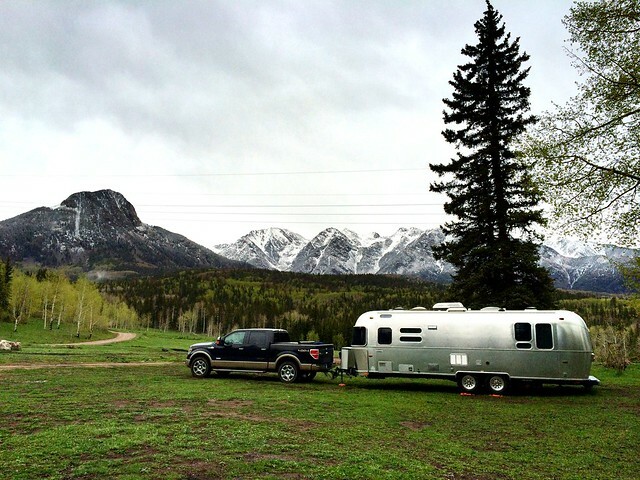 Towing an Airstream down backcountry roads is a little hairy but we managed it unscathed. 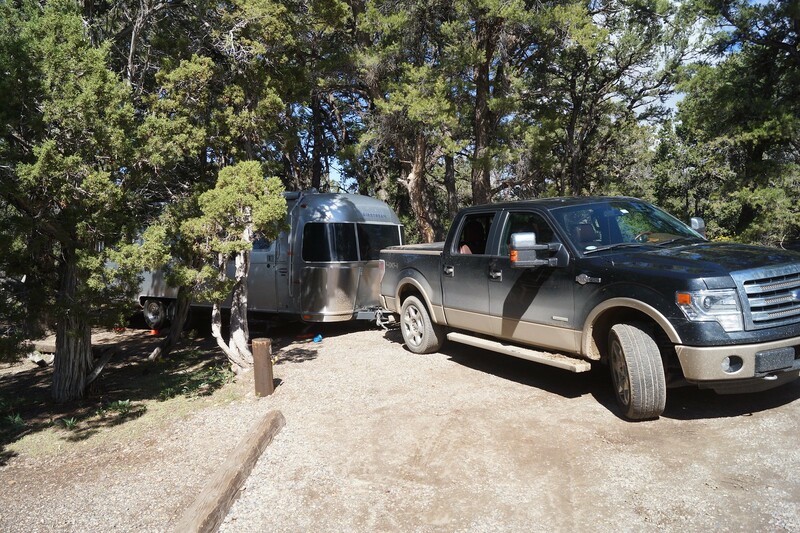 The Airstream batteries hold up really well and we only used the generator in the morning for Julie’s hairdryer. We noticed it struggled to keep up with that appliance, which was surprising, but we were at high altitude. On Saturday we continued our journey through the beautiful San Juan National Forest. We encountered a bike race – what an inspiration to see hundreds of riders of all ages peddling up thousands of feet. 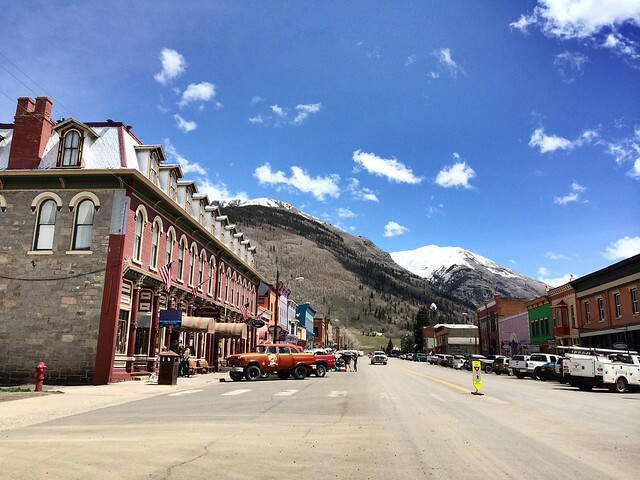 We stopped at Silverton for lunch in a saloon with an olde timey piano player, which was fun – albeit the world’s biggest tourist trap. Sweitzer Lake State Park let us fill our tank with water, ostensibly because we are Colorado State Park annual permit holders. I got the feeling I was the first person to ask. We filled quickly in the wind and rain. Finally we made it to the Grand Mesa. Because the Grand Mesa is flat-topped its elevation is deceiving. You think perhaps it’s a few thousand feet. The road to the top is long and steep. And as we climbed the air temperature started falling. Then we saw snow. Deep snow. Then it started snowing. At the visitor’s center we learned that most of our dispersed camping options were completely inaccessible due to snow and unfortunately so were some of the more scenic roadways. We were helpfully pointed to the Jumbo campground on the west side of the mountain. The campground was open but not in service yet. We saw only one other camper and after driving over some snow drifts tucked ourselves away in a corner. At this point we noticed a little damage. One of the steel fresh water tank straps was dragging on the road and the stairs were very bent. The first problem I believe occurred when we hit a rock in the road in the mountains, although we can’t be sure. The bent stairs I am fairly certain occurred when we turned off the Forestry road back on to the main highway in the San Juan National Forest. It was a a very steep intersection and we heard the awful noise of something getting high-grounded. Must have been the stairs. I bent the tank strap up off the road and tied it to the axle with zip ties. It’ll do for now. The stairs still work, painfully. So the Grand Mesa turned out to be a bit of a bust due to weather, but nonetheless we fared well for our second night of boon-docking. 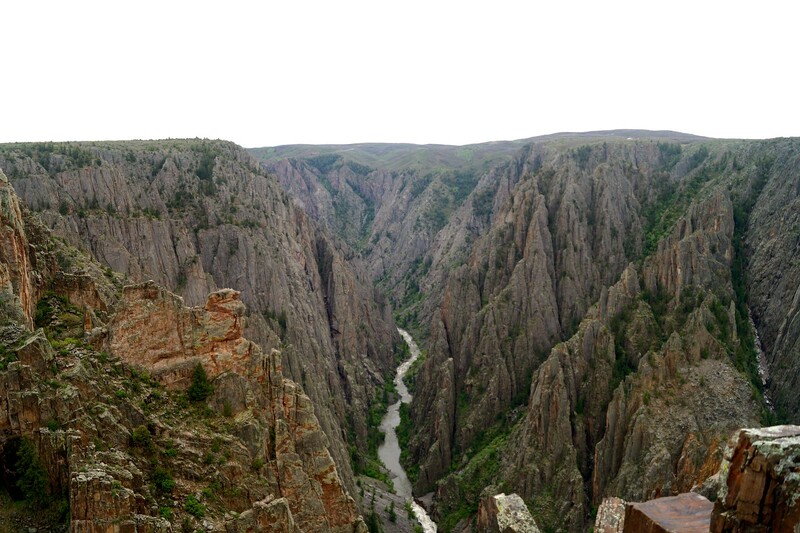 We decided to leave early on Sunday and try our luck at the Black Canyon of the Gunnison, a nearby National Park. 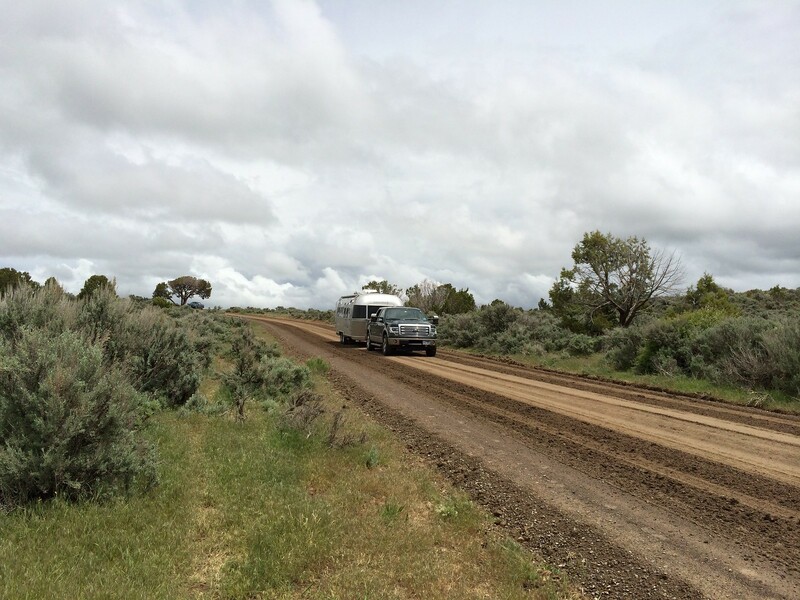 To get there involved an arduous and lengthy journey over a muddy dirt road called Black Canyon Road. We took it slow, averaging 10 – 15mph. We chose to stay at the organized north rim primitive camp ground. The campground itself is pretty, nestled amongst Juniper trees. But it’s also horrid for Airstreams. The sites are tiny, completely un-level and packed in next to one another. It apparently also doubles as an off-leash dog park which we could do without. It bothers me that this primitive campground costs the same as Pomona State Park in Kansas. Obviously being a long weekend it’s fairly busy and I can see this place being emptier during the week. Now while the campground was poor, the canyon itself was breathtaking (see Flickr photos). Julie and I agree it is more impressive in some ways than the Grand Canyon. It’s like something out of Lord of the Rings. The sheer drops range from 1,750 feet to 2,700 feet. The gorge is so narrow that the effect of that drop is magnified. It’s intimidating. “In 48 miles the Gunnison River loses more elevation than the 1,500 mile Mississippi River does from Minnesota to the Gulf of Mexico. The power of fast falling enables the river to erode tough rock.” – National Park Service. On Monday morning (5/25) we walked the 5 mile Deadhorse Trail enjoying much better weather. Alfred enjoy himself and we saw plenty of bear evidence. Then we hitched up and completed our five-something hour drive to Denver. Our route involved crossing the McClure Pass, 8,755 feet at 8% grade, and the Vail Pass, 10,662 feet at 7% grade. Neither taxed the Ecoboost particularly. It is of course very thirsty. Unfortunately though it is time to replace the brake rotors. So we accomplished three night without hookups and two nights completely free. After all this we are up to seven missing interior rivets in the Airstream.